RRResearch: Does hydroxurea treatment induce competence in H. influenzae? Does hydroxurea treatment induce competence in H. influenzae? Here's the data. 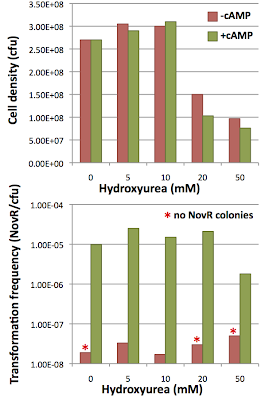 Wildtype cells at low density (3.4 x 10^7 cfu ml; no spontaneous competence) were incubated for 100 minutes in medium containing NovR DNA and different concentrations of hydroxyurea. One set of cultures also contained cAMP to partially induce the competence regulon. 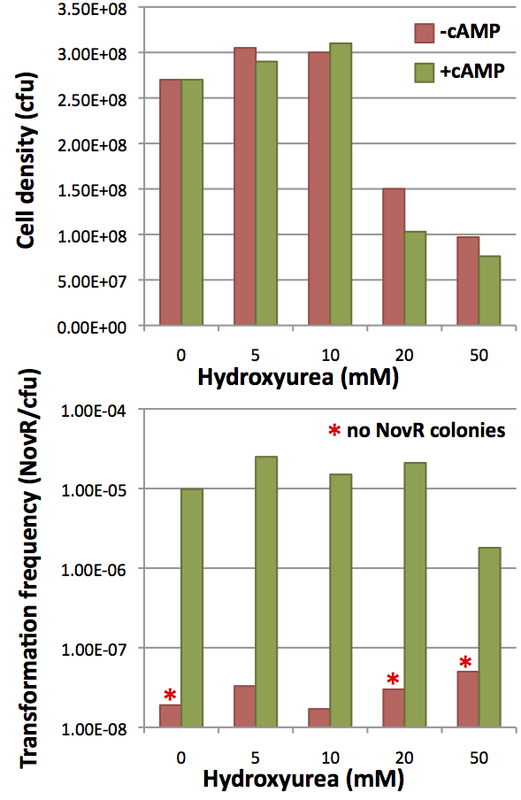 The upper graph shows that 5 and 10 mM hydroxyurea did not inhibit cell division (about 3 doublings), and that 20 and 50 mM allowed only 1-2 doublings. As expected the effect was independent of cAMP. The lower graph of transformation frequencies shows that competence was not significantly induced or enhanced by hydroxyurea.